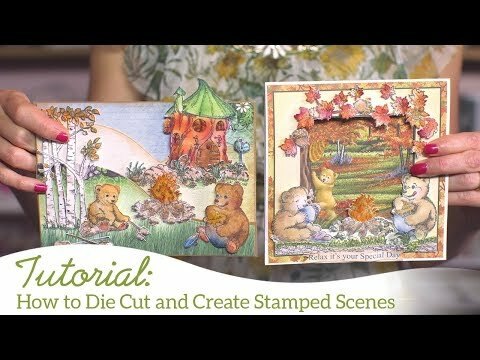 For more tips on creating with this collection watch the tutorial at here. Instructions: Let’s start creating this shaker mini album with 5 pages for inside. Take a thick cardstock for pages and cut them. Final size of the pages are 5” circle and decorate them with designer paper. Shaker embellishment is a 3D Chipboard decorated with a designer paper with sequins and prills, leaves sunflower accents cling stamp set with coordinating die, and the chipboard is painted with acrylic colours. Create flowers using the Classic Sunflower stamp set using Buttercup Archival ink on white cardstock and diecut with coordinating dies. Color them with buttercup and shape them with Deluxe Flower shaping kit. Use three layers for creating flowers and at the centre use dries clear glue and Redland Elements earth textures. Stamp various Sunflower Accents on the white cardstock with black Archival ink and die cut them with the coordinating die. Color them with Distress ink-Peeled Paint, Mustard Seed, Spiced Marmalade. Add Glossy Accents and sprinkle golden beads and clear glass beads. Stamp flowers from window box fillers stamp set with black Archival ink and and die cut them with coordinating die. Add just a little color in the centre using Mustard seed ink and add Go Man Go prills at the centre with dries clear glue. Take another white cardstock and stamp Happy Time Treehouse Cling Set with black and Plum Archival ink and colour them with Zig Clean Color Real Brush and cut them with coordinating dies, and add it to the top of the chipboard as shown on the pix. Decorate the inside pages according to your own choice. Die cut one Sentiment from the designer paper using the Luggage and Tags dies and paste it as shown on the picture. Die cut two beautiful die from Festive Holiday and paste it at the base of the chipboard and add one ring at the top of the album.